CULVER CITY, Calif. – From director Kevin Connolly (Entourage) comes the heartwarming coming-of-age adventure with an all-star ensemble cast, DEAR ELEANOR, debuting on digital and DVD July 5 from Sony Pictures Home Entertainment. Set in 1962, the film stars Liana Liberato (If I Stay) and Isabelle Fuhrman (The Hunger Games) as two teen-age friends who set out on a cross-country road trip to meet their heroine, former First Lady Eleanor Roosevelt. On their inspiring journey, Ellie and Max encounter an entertaining mix of characters, including a glamorous showgirl played by Jessica Alba (Fantastic Four), a mysterious ex-con played by Josh Lucas (TV’s “The Mysteries of Laura”) and a handsome cowboy played by Patrick Schwarzenegger (Grown Ups 2). The film also stars Luke Wilson (Concussion, Old School) and Joel Courtney (Super 8). 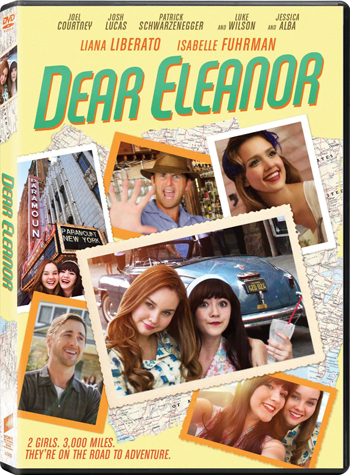 Special features on the DEAR ELEANOR DVD include a commentary track with director Kevin Connolly and an additional commentary track with screenwriters Cecilia Contreras and Amy Garcia. Best friends Max (Isabelle Fuhrman) and Ellie (Liana Liberato) decide to leave their rural hometown on an adventurous, cross-country road trip to meet former First Lady Eleanor Roosevelt. Sneaking away in a bright blue convertible belonging to Ellie’s dad (Luke Wilson), they set out with the wind in their hair and the radio turned up. While trying to stay a step ahead of Ellie’s father and the police, the girls cross paths with an eclectic mix of people, which truly make this an entertaining, once-in-a-lifetime experience. Also stars Jessica Alba, Josh Lucas, Ione Skye, Joel Courtney and Patrick Schwarzenegger. DEAR ELEANOR is directed by Kevin Connolly with a screenplay by Cecilia Contreras and Amy Garcia. It was produced by Chuck Pacheco, Caleb Applegate and Hillary Sherman with Robert Abramoff, David Hillary and Mary Vernieu as executive producers. DEAR ELEANOR has a running time of approximately 90 minutes. It is rated PG-13 for some suggestive material and smoking.